I recently saw this poster on Facebook. It occurred to me that it takes courage to laugh at one’s self. Sometimes this is simply a matter of taking ourselves less seriously. We are all human, we all make mistakes. Being able to laugh at them is a way of staying humble. Once I was directing a children’s choir during Mass and my son (maybe 12 at the time) was the cantor for the Mass. I was in the choir loft in the back of the church, he was on the altar. It was time for him to stand and announce the closing hymn. Lost in a daydream, he was not paying attention and try as I might, I couldn’t get his attention. I can’t remember if I eventually was able to catch his gaze or if I simply announced the hymn myself. As fate would have it, the hymn was “How Can I Keep from Singing.” The joke in the family became “Just don’t stand up.” He laughs with the rest of us. It is easy to get angry and perhaps sometimes natural to be embarrassed, but it takes courage to accept our own fallibility and laugh. I love this post. It’s so true if you can’t laugh at yourself then you can’t enjoy life. I’m glad you enjoyed it. I agree, laughter is the key to enjoying life. That, and butter. Laughing is something I do daily and even when things don’t appear humorous to others you’ll find me giggling. Sean just shakes his head at me. I’m glad you enjoyed them! I used to LOVE Tab when I was little, because it came in a pink can. Haha Mary, she keeps coconut water in her medicine cabinet! 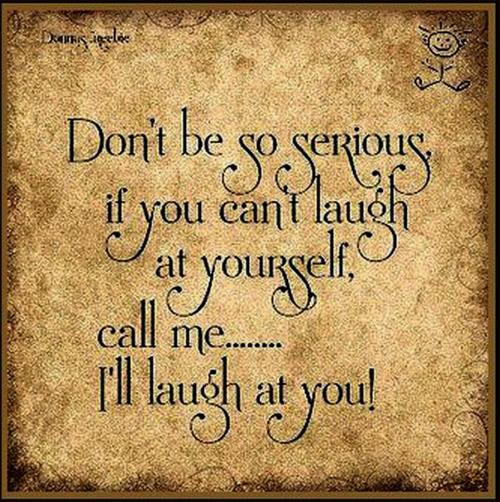 And its certainly better to laugh at yourself than cry! There is no more coconut water in my medicine cabinet. Over Christmas Liam and Meghan mixed it with the pineapple juice that was left over from our…whatever they were. Still, there is a rather eclectic mix.